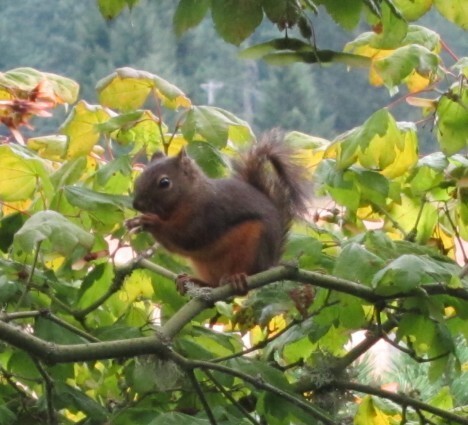 A Douglas Squirrel sitting outside the ranch house office in the vine maple tree eating maple seeds, delight to enjoy! The Douglas Squirrel is a native, northwest, endangered species of squirrel. A small squirrel in comparison to the commonly seen eastern gray squirrels; about half or less the size of eastern gray squirrels with an orange buff belly, and dark line demarking the brown back from the buff rust color of the belly fur. This individual was in the tree eating vine maple seeds for some time. He/she had a lovely, shiny coat and bright eye. Delightful scene of ranch wildlife.